The criminal defense lawyers at James G. Sullivan and Associates work hard to defend the rights and protect the futures of their clients. In addition to over 45 combined years of experience, they have the necessary knowledge and legal training to defend these challenging cases. 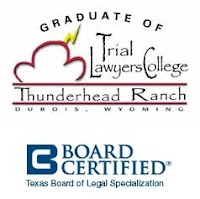 Houston attorney James Sullivan was honored to attend and graduate from the Trial Lawyers College founded by legendary lawyer Gerry Spence and to be invited to join The National Trial Lawyers organization. To discuss your case in confidence, call Sullivan for a free consultation at (281) 546-6428.